But the book is more than a remembrance of films past, it is a inward, spiritual autobiography (that reminds me of Jung's 'Memories, Dreams, Reflections') an account of those people, ideas and encounters that have acted as 'awakeners' helping shape his understanding of the world as a meaningful whole. Foremost among the people/ideas have been those of the esoteric yet practical philosopher, Rudolf Steiner, and yet though the indebtedness is clear, nothing (as Steiner would have wanted) is taken on trust (or that strange 'admiration' attendant on the charismatic) but sifted through the lenses of both experience and reason. 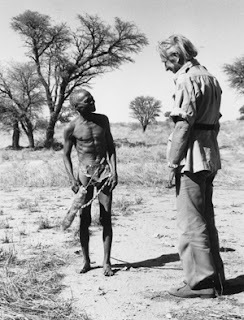 I owe to Jonathan my introduction to Laurens van der Post (with whom he also made several memorable films - on Jung and on the Kalahari) who became the subject of my one and only published interview. It was almost a disaster since I became so absorbed in what Sir Laurens was saying that I forgot to turn my tape over, so was left reconstructing from memory (or inventing though out of a deep engagement with that mercurial man's works). What remains with me foremost from the book is Jonathan's insistence that the heaven of the title is a 'state' present everywhere, every when, that we, with cleansed perceptions. look at the world, and act in it, with compassion. Simple to say, more complex to practice.